Opportunistic Tories are trying to take credit for an EU policy they steadfastly opposed at the time! In 2014 the European Parliament held a vote on reducing disposable plastic bag waste. The Tory MEPs in the European parliament voted against the measure and demanded a load of concessions from the European Parliament. In 2015 the legislation was finally passed in the European Parliament. The new measures oblige member states to either adopt measures ensuring that the annual consumption level does not exceed, on average, 90 lightweight plastic carrier bags per person by the end of 2019, and not more than 40 bags per person by 2025; or alternatively, to ensure that they are not given for free at stores and sales points by the end of 2018. Tory MEPs refused to vote in favour of this legislation. 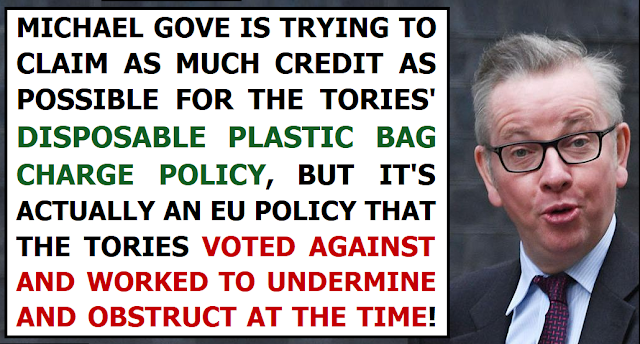 Now we fast-forward to January 2018 and suddenly Michael Gove and Theresa May are trying to claim credit for the shiny new Tory policy of ... errrm ...clamping down on disposable plastic bag waste. Neither the Tories, nor their sycophants in the mainstream press have bothered to point out that these measures against plastic waste originated in the EU. And neither is anyone pointing out that the Theresa May and Michael Gove are actually trying to steal credit for a policy that their fellow Tories in the European parliament voted against, and worked to undermine and obstruct. 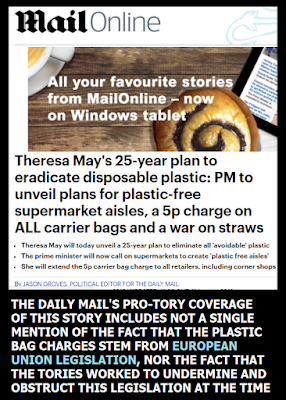 Take the coverage of the extended 5p plastic bag charge in the hard-right Daily Mail propaganda rag. There's loads of praise for Theresa May and the Tories in the article, yet not a single mention of the fact that the plastic bag charges are a result of EU legislation to clamp down on plastic waste, nor of the fact that the Tories tried to scupper these rules as they made their way through the European Parliament. If the rabidly anti-EU Daily Mail had any integrity whatever they wouldn't be presenting this extended plastic bags charge as a glorious victory for Theresa May, they'd be howling with rage at the nasty EU interfering with our God-given British right to lob as much plastic waste as we like into our waterways and oceans. 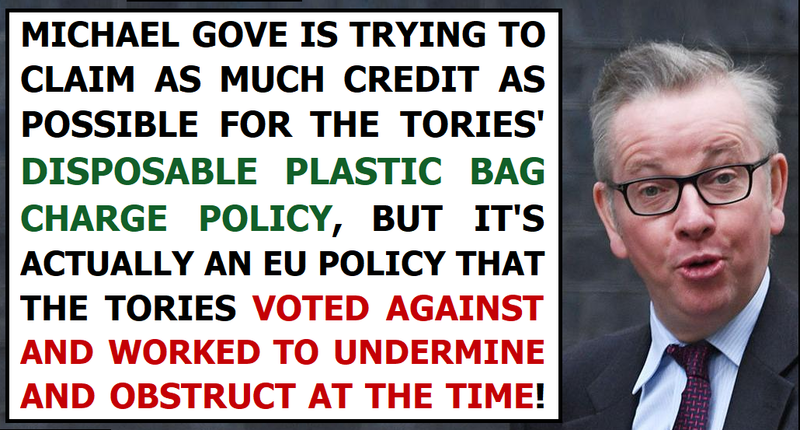 Just like the Daily Mail, it's obvious that the Brextremist Michael Gove is not going to admit that the policy he's attempting to soak up all the credit for is actually a product of the EU that he hates so much. 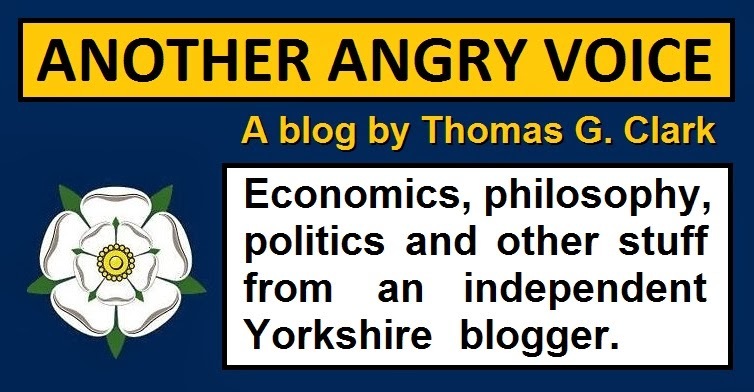 And neither is Theresa May going risk upsetting the new blue-kip demographic of rabidly right-wing and ultra-nationalistic ex-ukippers she's rendered herself completely reliant upon with a dose of the truth. There's absolutely no way she'd dare to destabilise her own position by explaining to this fickle and reactionary mob that her shiny new policy is actually one of the measures that her party tried and failed to defeat in the European Parliament. Of course it's a good thing that measures are being taken to address the shocking levels of plastic pollution in the environment, but to see Tories attempting to wring as many positive headlines as possible out of a policy they steadfastly opposed in the first place is yet another demonstration of what a shifty and opportunistic bunch of charlatans these people actually are.